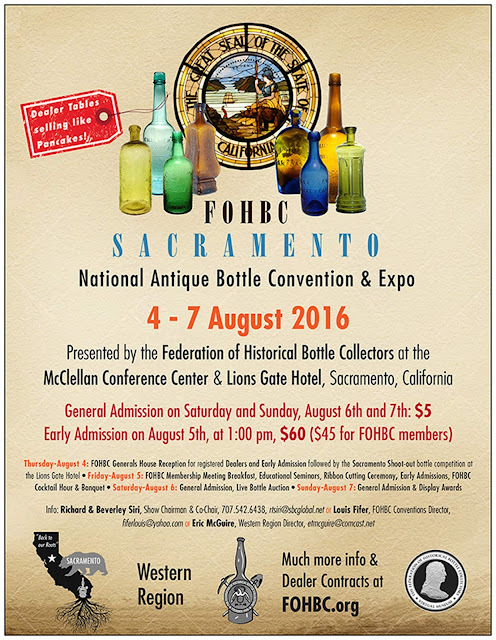 Western Whiskey Gazette (WWG): FOHBC - National Expo - Sacramento Ca. "This is going to be a large event with four days of antique bottle related activities. The next time such a large gathering could occur in the West will be in the year 2020. I highly encourage all bottle diggers, collectors, dealers to get involved with this show! Enter the bottle shoot-out, participate in the FOHBC bottle auction, put on a bottle display, give a seminar on your favorite bottle related topic. We in California are fortunate to live in a state with so many antique bottle enthusiasts with great bottles to be found in the ground, through old time collections, in antique stores and flea markets and yard sales. Next year everyone in the West will have the opportunity to be a part of the largest gathering of antique bottle enthusiasts to four fun filled days of buying, selling, trading of antique bottles, jars, insulators, and related antique glassware. This will be a history setting event in California!"